ALBUQUERQUE, N.M. — Sandia National Laboratories’ Jaime Gomez was too busy to celebrate the successful launch of the latest nuclear detonation detection system — he was already deep into the next generation. 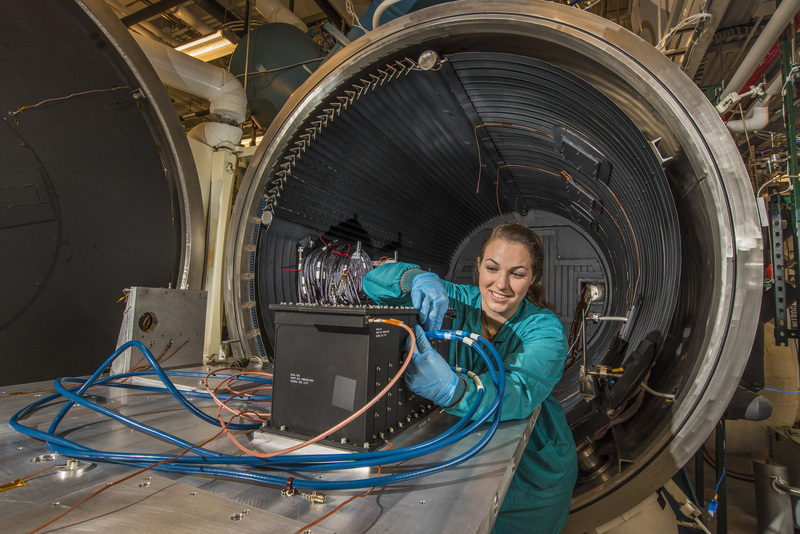 Sandia National Laboratories researcher Rachel Trojahn prepares one of the subsystems, or boxes, that makes up Sandia’s Global Burst Detector for a test in the labs’ Flight Test Chamber. The chamber exposes individual boxes and the fully assembled flight system to the vacuum and thermal environment they’ll experience in orbit. (Photo by Randy Montoya) Click on the thumbnail for a high-resolution image. “We work 10 years ahead, from the time we get a concept for what the next generation of improved technologies and sensing will be,” McKenney said. Each GBD program starts with the initial concept, followed by approvals, engineering development, an extensive and complex design cycle and production and testing. The work is funded by the National Nuclear Security Administration. Sandia integrates it all into an overall system and performs seemingly endless tests. When a satellite launches, everything aboard faces extreme temperatures, vibration and shock. Sandia’s testing and computer models help determine how the rigors of launch and deployment will affect the GBD. Even that isn’t the end. “We have a group that examines telemetry coming down from our payloads so we can monitor the state of health,” McKenney said. Developers use that information to improve next-generation technology. Under an agreement with the Air Force, Sandia also develops ground station components that support the Nuclear Detonation Detection System and integrate data from all the satellites.